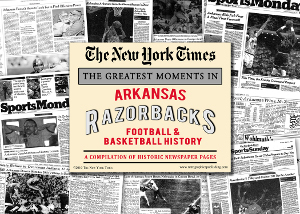 This unsigned New York Times Article Compilation contains fascinating stories on all of the great Arkansas Razorbacks Football and Basketball moments. These are Genuine New York Times reprints that come in a full size newspaper format with 63 pages of New York Times coverage including a Special Color Section. Each Page Measures: 15W x 22L inches. Terrific memorabilia addition or gift idea for the avid sports fan in your life !